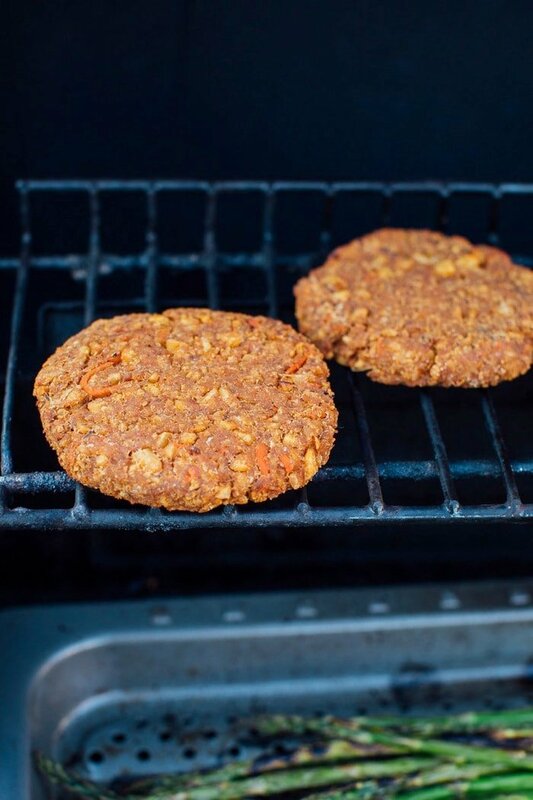 A delicious veggie burger that’s made with tempeh and holds together so well you can cook it on the grill! Added bonus, it’s packed with plant-based protein and it’s vegan + gluten-free! This post is sponsored by Lightlife. “This is my favorite tempeh dish you’ve ever made.” Bold statement courtesy of Mr. Isaac. But that’s how good this tempeh burger is! I’m so glad I created these burgers just in time for grilling season. We honestly grill all year long, and by we, I mean Isaac. I don’t personally grill until it’s warm enough to stand outside for 15 minutes or longer. Right now is the prime time! The warm weather + longer days = a winning grill combination. I’m pretty picky when it comes to veggie burgers. A lot of them have crappy ingredients, are soft and mushy, and don’t have a lot of protein. This tempeh burger isn’t any of those things. 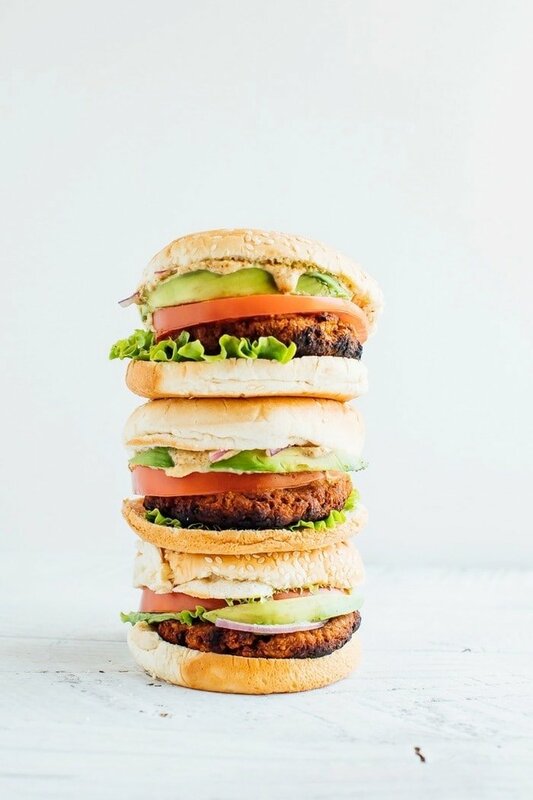 First up, this is a veggie burger that is packed with plant-based protein which means it will actually fill you up! I try to eat protein with every meal and this burger makes it easy. Another win: the flavor. 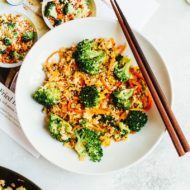 The veggies, nutritional yeast, balsamic vinegar and spices… they all come together to make the tastiest vegetarian (and vegan!) veggie burger you’ve ever had. Lastly, the texture! It isn’t mushy in the slightest and it holds up so well on the grill. I’ll definitely be making these for barbecues and cookouts this summer with friends. Pair them with a tasty sweet potato salad, broccoli raisin salad, jicama fries or sweet potato fries and you’ve got yourself a full meal. In terms of what brand and type of tempeh to buy, I always recommend Lightlife. It’s the best of the best! 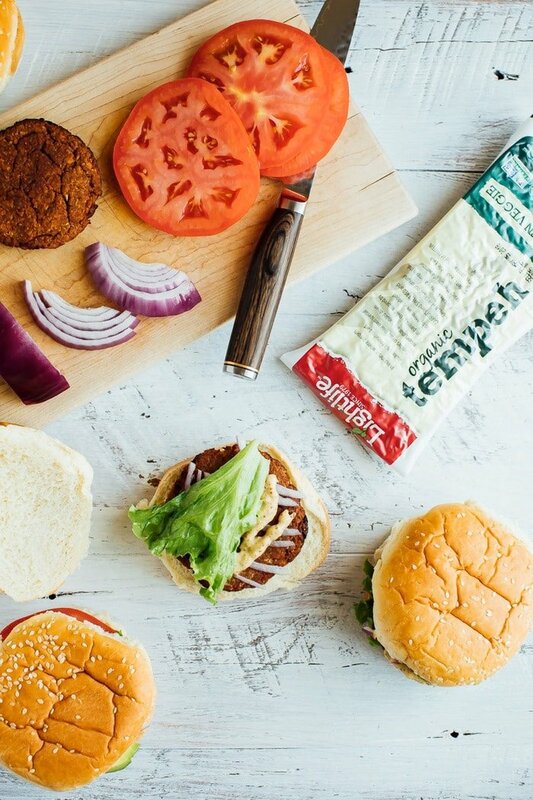 For these veggie burgers I really like the Garden Veggie variety, but any of the Lightlife tempeh will work! Learn more about tempeh and see some of my other favorite tempeh recipes. Pro tip: To make sure these burgers hold together well when grilling, let the mixture sit in the fridge for a couple hours before forming into patties. There’s nothing worse than a crumbling burger, am I right? 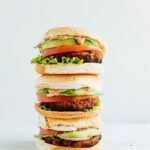 A delicious veggie burger that’s made with tempeh and holds together so well you can cook it on the grill! Added bonus, it’s packed with plant-based protein. Cut block of tempeh into 4-6 pieces and place in a pot with water and a steamer basket. Steam for about 7-10 minutes. Remove from heat and let cool. Heat a skillet over medium heat with ½ Tablespoon olive oil. Once oil is warm add the onion and carrots into the skillet and cook until onions are soft and translucent, about 5-7 minutes. Let cool. 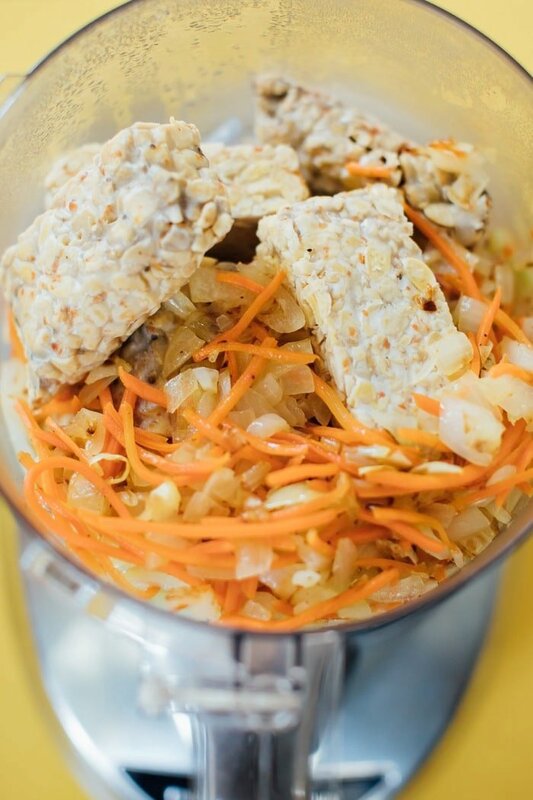 Put the cooked onion and carrot mixture into a food processor with the steamed tempeh, nutritional yeast, oat flour, flaxseed, balsamic vinegar, tamari, coconut sugar, garlic powder, chili powder and paprika. Pulse until everything is chopped and combined — just don’t over-process the mixture because you want the burgers to have a little texture. Transfer the tempeh mixture into a large bowl and let chill in the fridge for 2-3 hours. Once chilled, form mixture into 2-3 patties. Heat grill to medium heat. Spray grate with nonstick spray and add the patties. Cook each side until browned, about 6-7 minutes total. Put the burgers on a bun and serve with condiments of your choice. I used spicy mustard, onions, lettuce and ketchup. What’s your favorite dish to bring to barbecues and cookouts? 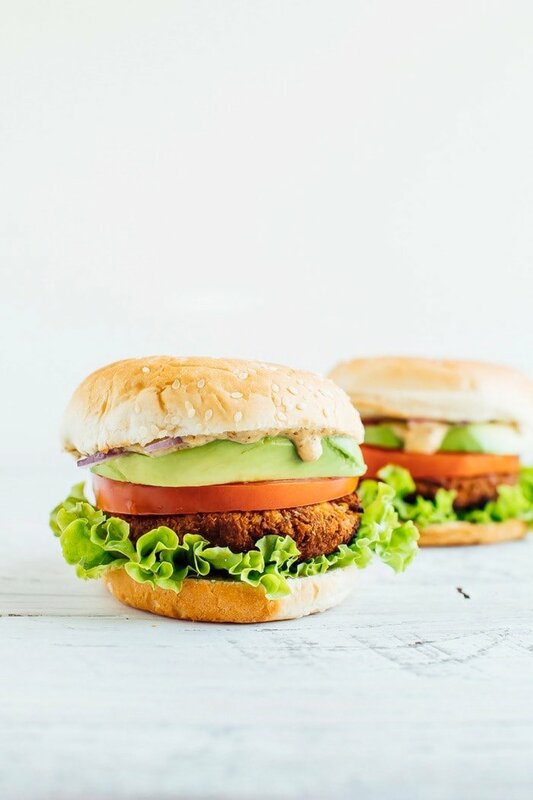 Are you bold enough to bring a batch of these tempeh veggie burgers? So exciting when I have all the ingredients in a recipe! 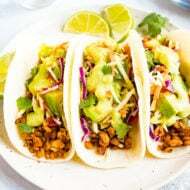 Can’t wait to make these as I’ve had a package of tempeh in the fridge for a week, but wasn’t sure what I wanted to do with it. These look delicious – thanks! Hooray! 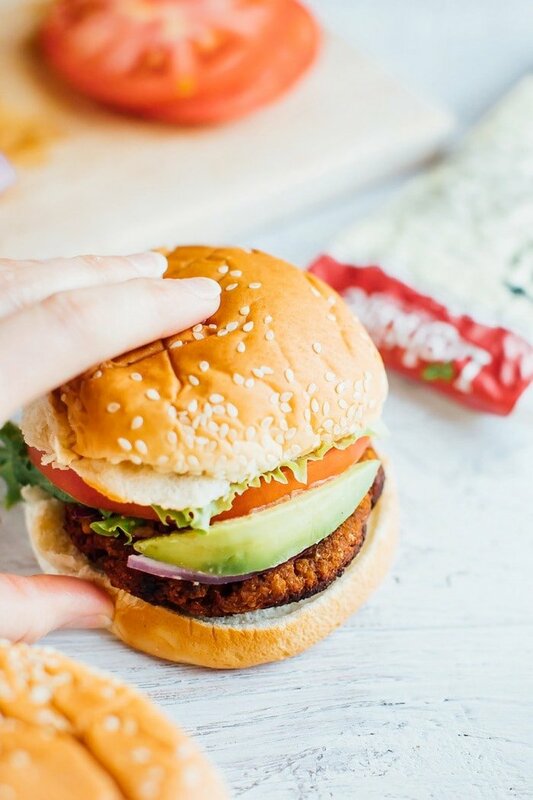 Can’t wait to hear what you think of this veggie burger recipe, Courtney. Same!! Grilled foods are probably my favorite. I also love roasting but I think grilling is #1. Can’t wait to try these! Love a good veggie burger that isn’t mushy or falls apart. This tempeh burger totally fits the bill. It isn’t mushy and doesn’t fall apart at all. You will love. I love tempeh!! Lightlife is the best 🙂 I’ve got some in my fridge right now so i can’t wait to try these! These look so yummy! Could you recommend other spices besides chili powder—even in such small amounts it bothers my stomach. 🙁 Thanks! 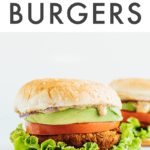 This has quickly become one of my favorite veggie burger recipes of all time (and I’ve been a vegetarian for 20 plus years). I’ve already made this recipe four times! And now I always double the recipe. These burgers hold together unbelievably well when both grilled and baked. They are full of umami, and have the most amazing texture. They are so delicious on their own that I actually prefer them without a bun alongside some roasted potatoes or on top of a salad. Thank you so much for creating what has become a staple in my kitchen! I’m making these tonight! 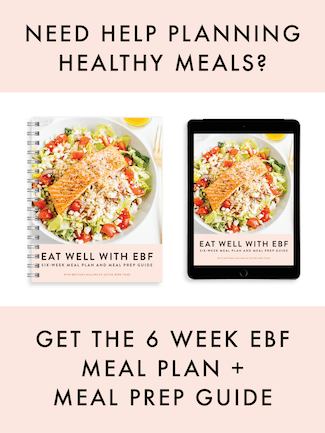 Could I sub almond flour for oat flour? If so, do you think it would be a 1:1 conversion? Update: I used the almond flour and I wouldn’t recommend it. They held together great and the outsides got nice and grilled, but the overall texture of the patty was mushy for my taste. Will try another time with the oat flour! I’m sure that was the problem – almond flour has more moisture and fat, so I probably should have added double the flour. 🙂 The flavor was nice, so will definitely try again with oat! Hi Lindsay! Sorry I wasn’t able to respond faster. Oat flour is more dense than almond flour so I would assume that you’d need to use more almond flour. Great question. 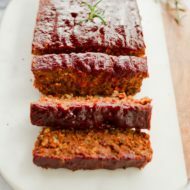 I haven’t tried baking this specific recipe but I’m sure you can because I’ve baked or pan-cooked other veggie burgers. Tempeh is already cooked so really all you’re doing is warming up the burger and crisping it up a bit! If you want to try baking it, I’d do 375°F for 20 minutes or so, flip the burgers half-way through cooking and maybe finish with a 3-5 minute broil to get the edges to crisp. Let me know if you try it! Oh my goodness, these were fantastic! Made them tonight and even the 8 year old gobbled it up! I made the recipe as written, subbing regular sugar for coconut sugar only because I was out and couldn’t justify running to the store for one ingredient. Great texture and full of flavor. Thank you for a great recipe! I’ll definitely be making this again! Hi, is nutritional yeast needed? This is, without a doubt, the best veggie burger I’ve ever eaten! I continue to use this recipe, and I freeze the extras for a quick and easy dinner option! Love, love, love them!